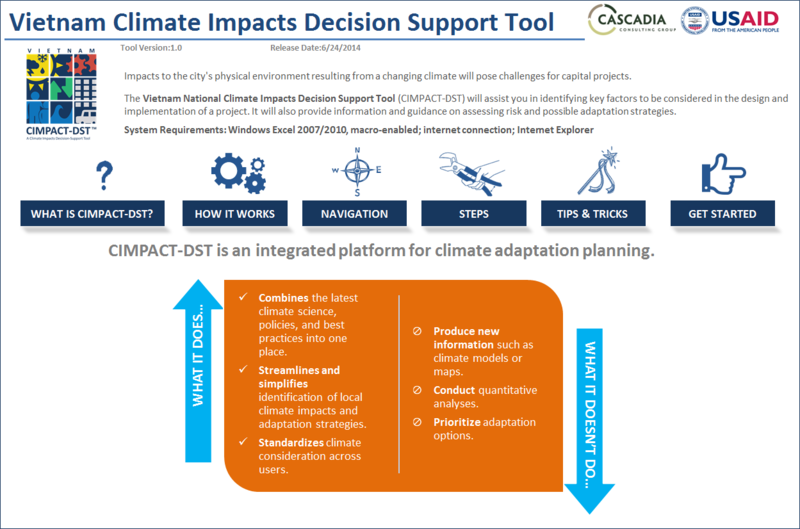 The Vietnam Institute for Environmental Planning, Urban-Rural Infrastructure (IRURE) and the Vietnam Institute for Urban-Rural Planning (VIUP), in collaboration with Cascadia Consulting Group (Cascadia) and on behalf of the U.S. Agency for International Development (USAID), are in the final stages of customizing a Vietnam Climate Impacts Decision Support Tool (CIMPACT-DST) in support of integrating climate change considerations into urban planning activities in Vietnam. Piloted in Thua Thien-Hue in 2013, CIMPACT-DST has thus far helped to develop at least three new climate-resilient urban master plans in the province. IRURE and VIUP are convening a half-day national workshop at Melia Hotel on July 24, 2014 to introduce the newly released Vietnam CIMPACT-DST tool to potential users and audiences. Workshop participants will include representatives from local and national universities, professional organizations, and governments, as well as from international funding agencies and research institutions. Participants will have the opportunity to attend a brief formal demonstration and training on the Vietnam CIMPACT-DST, hear case study examples from Tool users, and participate in discussion around the future deployment and application of the Tool in Vietnamese urban planning. All UCR-CoP participants are invited to the workshop. For more information about this event or the Vietnam Climate Impacts Decision-Support Tool, please visit the program online at http://goo.gl/a9HNgi, email Ms. Tran Minh Thu at thu@cascadiaconsulting.com, or call Mr. Nguyen Ngoc Huy at 0913468451. Please RSVP by July 18. We look forward to seeing you on July 24! This entry was posted in English / Tiếng Anh, Working Group Meeting. Bookmark the permalink.